Celebrate the 50th anniversary of Star Trek with the fourth of four coins featuring some of the most beloved Star Trek characters. His alien origins reinvented a small community in Alberta, while his iconic salute and unique wisdom have made him one of the most respected characters of the Star Trek universe. 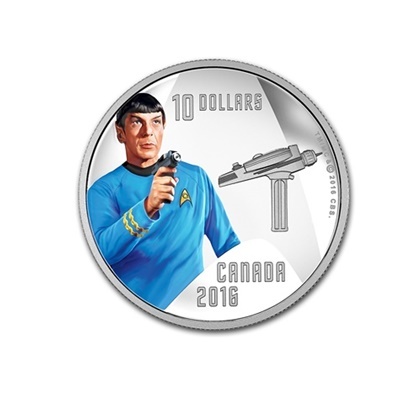 As the Royal Canadian Mint celebrates the 50th anniversary of Star Trek, this fine silver coin pays tribute to the wisdom of Spock (portrayed by actor Leonard Nimoy) and features the futuristic phaser introduced in The Original Series. Each coin is 99.99% pure silver. Contrasting finishes enhance the intricate engraving, while vibrant selective colour captures the likeness of each Star Trek character in 99.99% pure silver. Stunning Custom Boxes. Each coin is encapsulated and enclosed in a stunning custom box. 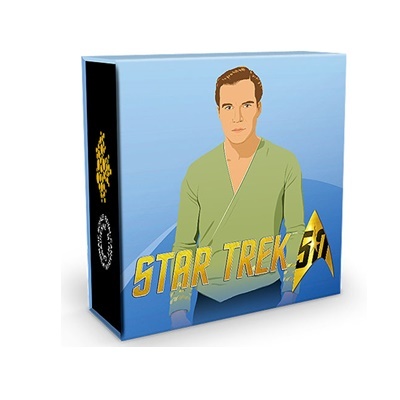 The colourful packaging boasts a contemporary design and features an illustrated portrait of each Star Trek character alongside the Star Trek 50th anniversary logo. A one-of-a-kind addition to any collection and an unforgettable gift that will be treasured and valued by the Star Trek fan in your life.